A vast expanse of pristine wetlands, Everglades National Park holds the distinction of being the largest tropical wilderness in the U.S. Overflow from Lake Okeechobee into the Florida Bay formed these wetlands, which are home to manatees, American crocodiles, Florida panthers, and an array of wading birds, land birds, and birds of prey. The diversity of plant and animal life here has earned the park recognition as an International Biosphere Reserve, a World Heritage Site, and a Wetland of International Importance. It's one of only three places in the world to occupy a spot on all three lists. You'll find trails for hiking and biking in drier sections of the Everglades, while canoeing, kayaking, boating, and fishing are popular along the many waterways. December to March is the most popular time to visit due to more comfortable temperatures, drier air, and lower mosquito activity. Everglades National Park is in Florida (FL). Take a peek at our international travel planner: Everglades National Park and its charms laid bare and easily scheduled. 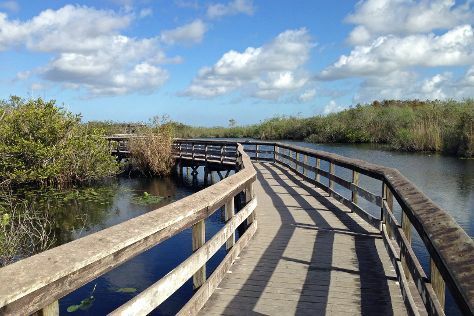 Everglades National Park runs two full-service campgrounds inside its boundaries: Long Pine Key and Flamingo. The former operates on a first-come, first-served basis, and the latter accepts reservations. If you prefer bunking down on a mattress, Homestead and Florida City are your most convenient options. These two towns sit adjacent to one another about 16 km (10 mi) from the park's main entrance, and in them you'll find numerous economy chain motels. North of the park, the Miccosukee Reservation features a hotel and casino. If you're traveling Florida's western coast, Everglades City offers a few rustic inns, lodges, and economy motels.